Gigi’s residence holds period pieces suitable to her 1700 era home. In keeping with those times, she fills her house with natural materials from her garden to make her home even more special during the Christmas season. The Colonial Williamsburg historical village in Virginia also keeps this practice alive, using evergreens, apples, and clippings from the garden to decorate houses and shops for Christmas. One of the favorite accents popularized by Williamsburg is the pyramid apple tree. 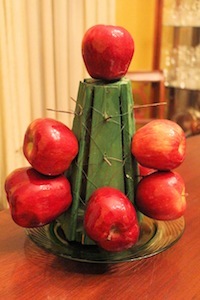 I have the old wooden pyramid with spikes to hold the apples and wire to keep pieces of small greenery tucked in between the apples, filling out the form. Ever the innovator, Gigi decided that her large pot of ivy would make a good apple tree. 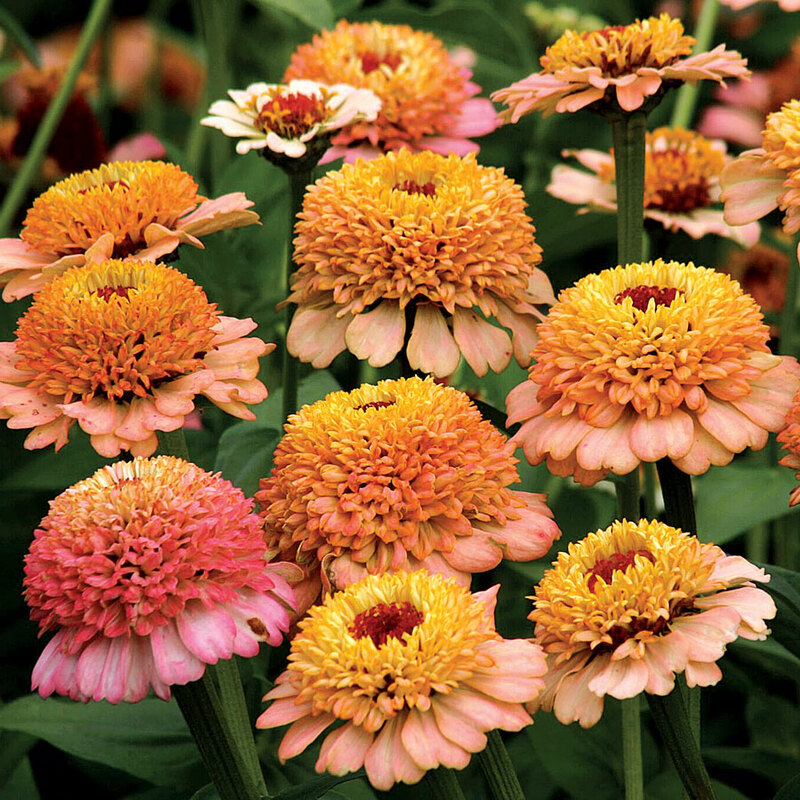 She grew it around a pyramid-shaped form with small cup holders attached. This turned out to be the perfect apple holder amongst the ivy. 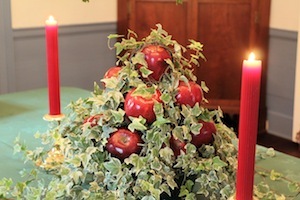 If you would like to make the ivy apple tree, you might search out flea markets and find a form you could use or visit the Colonial Williamsburg Marketplace where you can purchase a Stackable Iron Apple Cone form or a Circular Iron Centerpiece form. I saw a tiered cupcake holder recently at a department store that would work beautifully. If your ivy is not growing indoors, bring it in and clean out any debris resting in the plant. Give the leaves a light misting and make sure the pot is well watered. 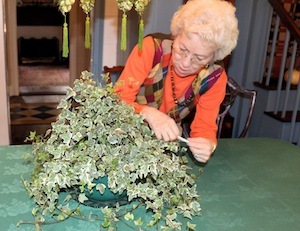 Gigi especially likes the variegated leaves of her ivy but green ivy would look just as good. 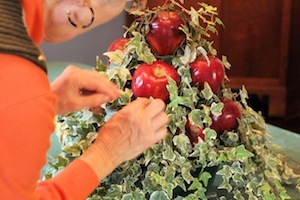 Try making your ivy apple tree for this year’s Christmas display by untangling the ivy and working a pyramid shaped base into the middle of the pot. Run the ivy back and forth up and down until you have a pleasing pyramid shape. If you lack ivy large enough, start now with a small plant and train it around an apple holder so it will be ready for next year. As the ivy grows, you can hide the holders with the vines and just pull them aside to insert the apples when the time is right. Gather bright red apples and shine them with a paper towel dipped in vegetable oil. Vegetable oil shine means you can still eat the apples after you take them out of your arrangement, whereas if you wax them they are inedible. (Displaying them on spikes also ruins them for after-eating.) Arrange the apples at even intervals into the ivy, nestling them so that their tops and some of their sides are visible above the leaves. Place your arrangement on a base; a small tray or glass plate works well. A small inconspicuous saucer you can hide under the ivy will keep any leaks in check. Using a base makes it easy to move the plant to the sink for a little misting or a drink of water. Utilize the apple-ivy tree as a centerpiece on your table or as an inviting arrangement on a sideboard or side table in the foyer. Add red candles on either side to highlight this bit of Colonial Williamsburg. You are well on your way to giving your home an old-fashioned Williamsburg Christmas look.